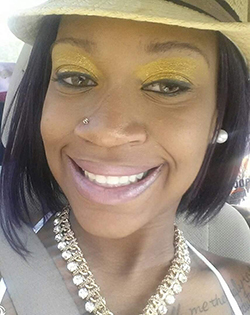 Zackia L. Yancey, 27, of New Haven, entered eternal rest on November 9, 2018. Zackia was born in New Haven, CT on April 4, 1991, daughter of Zachary Yancey and Kimberly Guy. In addition to her parents, she leaves to cherish loving memories, a daughter, Sevyn Guy; a brother, William Simmons, Jr.; sisters, Kymeshia White and Lowreshia Brown; and a host of other relatives and friends. A celebration of Zackia’s life will be held Friday, November 16, 2018, at 11:00 a.m. at Salvation and Deliverance Church, 127 Thompson St., New Haven. Viewing will be held at the church from 10:00-11:00 a.m. Burial will be private. My prayers are with the family during this time. I wish Zackia eternal peace. We are so very sorry to hear of the loss of your beautiful daughter, Kimberly. Our hearts and prayers are with you during this terrible time. Holding you and yours in love and light, my friend. Peace. Mary & Doug. We sincerely are saddened and offer our deepest sympathies to the family for the loss of your dearly loved one. We are very sorry to hear of the loss of this beautiful young lady. May your fondest memories sustain you during this very difficult time. to my loving cousin i am very sad that you are gone but you will always be i my heart s.i.p. cousin love you always .